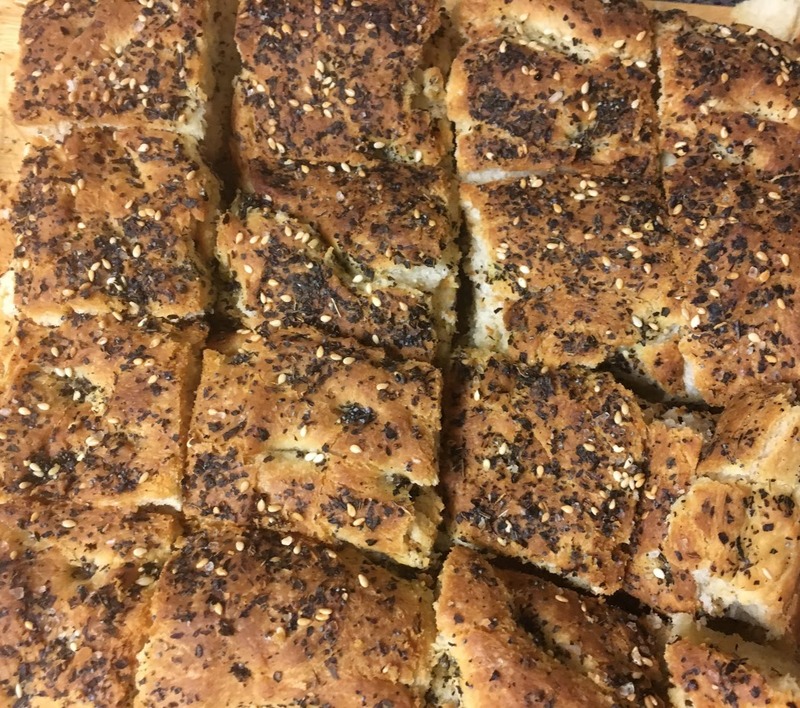 During a recent after school cooking class, I taught a group of middle schoolers how to make focaccia, a classic Italian flatbread coated in olive oil and sprinkled with sea salt or herbs. 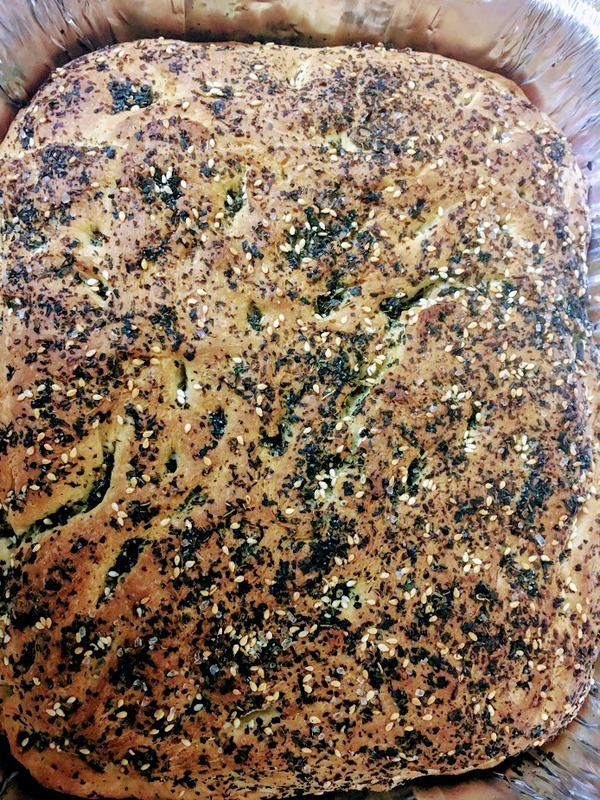 One student decided to top the dough with a unique combination of seasonings: toasted sesame seeds, dried mint, sea salt, poppy seeds, and a pinch of cayenne pepper. The result was one of the best focaccia loaves I’d ever tasted! Dried mint is what we had available, but fresh mint would work nicely as well. Pour water into a large mixing bowl. Add yeast and sugar, stirring gently until dissolved. Set aside until mixture is bubbly and foamy. Stir in 1/2 cup of olive oil, flour, and salt, until a soft dough comes together. Turn onto a floured surface and knead until smooth and elastic. Return dough to bowl, cover with a towel or plastic wrap, and set aside to rise until doubled in size, around 45 minutes. Meanwhile, pour remaining 1/2 cup of olive oil into a 10 x 14 inch pan, and set aside. When dough has risen, transfer to pan. Turn dough over so both sides are coated with olive oil. Press dough into the bottom of the pan, stretching it so it fits the size of the pan. Make sure to press all the way to bottom of the pan with your fingers to form indentations throughout the dough. (This creates focaccia’s classically uneven, bumpy crust.) Cover with plastic wrap or a towel and let rise a second time, around 30 minutes. Preheat oven to 425 degrees F. When dough has risen, sprinkle surface liberally with toasted sesame seeds, poppy seeds, mint, basil, black pepper, and sea salt. Sprinkle on a small amount of cayenne pepper, if desired, to add a hint of spice. Bake for around 25-30 minutes, until crust is golden brown. Let cool in pan before cutting into pieces.